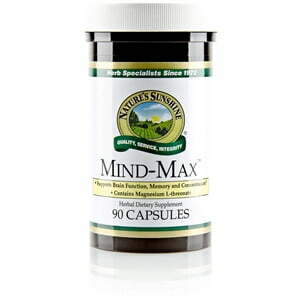 Nature’s Sunshine Mind-Max promotes brain health and fights the effects of aging on the brain. As the body ages, brain weight decreases by 5 to 20 percent, reducing memory and attention ability among other cognitive functions. Magnesium l-threonate, a highly absorbably form of magnesium and a key ingredient of Mind-Max, protects nerve synapses to slow the effects of aging on the brain. 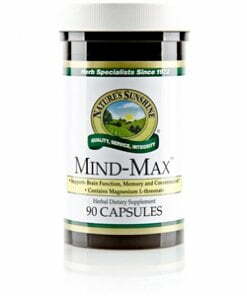 Mind-Max blends magnesium l-threonate with gotu kola aeria parts, bacopa leaf, and ginkgo leaf to promote proper circulation and brain function. Instructions: Take 3 capsules before breakfast and 3 capsules before bed. Only nighttime dose is recommended in the first week, add morning dose as tolerated. Capsule (gelatin, water), cellulose, magnesium stearate (vegetable).